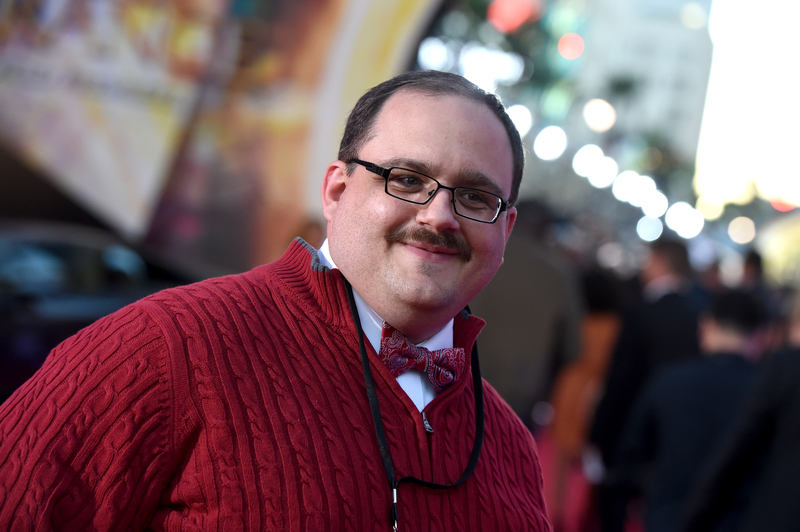 In a new interview with The Hollywood Reporter, internet sensation Ken Bone reveals that he has cast his vote in the 2016 presidential election. Since he rose to fame as an undecided voter after being one of the lucky audience members to ask a question during second debate between Hillary Clinton and Donald Trump, it's natural to wonder who he ended up supporting. Unfortunately, Bone has repeatedly stated his intention to never reveal his final choice. He teamed up with IZOD for a campaign encouraging people to vote, just days after going viral. When asked in interviews why he refuses to share his final pick, Bone always cites his worry about potentially getting off-message. “Once I tell anyone who I’m voting for, I kind of lose my opportunity to just say, ‘Get out and vote.’ I don’t care who you vote for,” he told Jimmy Kimmel during an appearance on his show. “I just want everybody to get to the polls and make their voice heard. And if you listen to the fat guy from St. Louis, you’re not listening to your own heart and conscience." Still, Bone has shared several of his political views, and it's interesting to try and figure out which ones ended up having the most influence on his vote. His energy question at the debate is a useful clue to guess at his politics. Bone asked, "What steps will your energy policy take to meet our energy needs, while at the same time remaining environmentally friendly and minimizing job loss for fossil power plant workers?" His concern for the environment is on the more progressive side of the political spectrum, while his worry about fossil power plant workers potentially losing their jobs is a talking point Trump was more eager to bring up on the campaign trail than Clinton. Bone has also been outspoken regarding the issue of homelessness. He's used his platform to raise money for the St. Patrick Center in St. Louis, and we asked why he chose homelessness as the cause to fight for, he said, "St. Patrick center provides temporary housing, job training, drug counseling, and help with mental health issues. There is a severe homelessness problem in this country. Most of us are one or two paychecks away from being homeless as well. We need to start seeing and intervening on their behalf." The St. Patrick Center website states that 50 percent of its budget comes from government funding; the Republican nominee doesn't have the greatest record when it comes to government aid programs like Medicare, Medicaid, welfare, and food stamps. In his "Ask Me Anything" thread on Reddit, a commenter trying to figure out his political leanings asked him on his opinions about healthcare, to which Bone said, "Single payer Healthcare seems like the way to go. The affordable care act is kinda broken, but going back to the way it was before would be a nightmare. It seems to me like there's no way to go but forward." Since Trump claims to be against single-payer healthcare (despite supporting it in the past) and Clinton agreed to a Democratic platform with a healthcare plan inching toward a single-payer system, the other commenter remained confused. "Okay, this has just raised even more questions on why you were an undecided voter," they wrote. "Like, Why Trump in the first place? I could understand if it Were Bush or Rubio again[st] Clinton, but he's so violent and seemingly dangerous. What do you like about both Candidates?" Bone responded that there was very little he liked about either candidate. If we look back to the second debate, Bone stated in an interview that while he was "impressed" with Clinton, he was still more inclined to vote Trump. Considering that this was after a year of scandals in which Trump had been charged with with everything from racism to sexual assault, it's hard to imagine what could possibly sway a voter who's still convinced Trump could be a better president than Clinton. It leads one to conclude that either Bone found Clinton's scandals about emails and her foundation more concerning than Trump's controversial behavior, or he genuinely felt the Republican was a more capable candidate than the Democrat. It has been a month since Ken Bone first entered the public consciousness, so there was enough time for him to go back and forth on a decision. If I had to guess, I would be inclined to say he chose Trump. This would be based on his previous lean toward the businessman and the revival of Clinton's email scandal a week before Election Day. Unless he changes his mind on keeping his choice a secret, though, we'll never know for sure.